Different from chemical vapour deposition (CVD) and physical vapour deposition (PVD), atomic layer deposition (ALD) is based on saturated surface reactions. In this case, the thin films are grown in a layer-by-layer fashion allowing sub-nanometer thickness control, low temperature depositions, good uniformity and superior step coverage on high specific surface area components compared to CVD and PVD. These advantages of ALD over other thin film deposition processes have been conventionally applied mainly in semiconductor electronic industry on the preparation of layers of outstanding High-K dielectric materials. But, due to the advances in tool design and recipe development, the importance of ALD is rapidly expanding for producing innovative nanoscale materials. ALD new applications are highly multidisciplinar. It has an emerging potential on photovoltaic cells, flexible electronics, enhanced performance glass, paper and textiles, new generation transistors, sensors, and advanced energy materials technology. Innovations brought by nanotechnology to biosciences and biosensors are also proving to be good candidates to benefit from these potentialities and its surface functionalization. Under this scenario, this proposal intends to build up an outstanding Research and Development department at a recently created SME (CTECHnano) that will be focused on extending the applications of ALD technique to all the emerging and/or unexplored industrial areas mentioned above. This action will contribute to enhance European industry competitiveness on the surface modification manufacture. 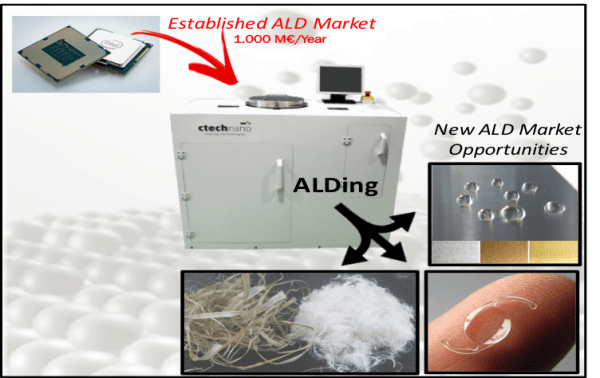 ALDing proposes to transfer a well-known materials deposition technique in the area of electronics to completely different applications where it can make a revolutionary improvement of the outcomes in comparison with the coating solutions already available in the market. The new designed ALD deposition tool is unique on the market and will allow the easy adaptation of the chamber to the requirements of each proposed target. The awarded researcher, Dr. Vila Juárez brings with her more than 18 years of research experience on materials science and surface modification. During her intensive scientific career, she has gathered knowledge on materials deposition techniques, design of deposition tools and on the resolution of technical problems all related with materials surface modification. She has knowledge of the behaviour of materials under different environments, such as biological, mechanical stresses, or environmental scenarios. This action allows to merge together the already strong interdisciplinary profile of the researcher skills as a scientific group leader, with the final step of getting training in product management, and business strategies. These factors all together are the recipe to train professionals that can, in a realistic way, impulse scientific efforts to real applications in an industrial environment.